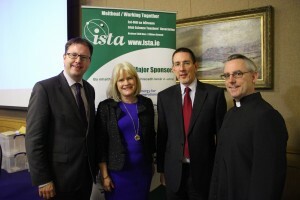 Left to right: James Lawless T.D., Sheila Donegan, Prof Aidan Mulkeen Vice President Maynooth University and Eoin Gill. I was delighted to attend the opening of the Irish Science Teachers Association (ISTA) conference held in Maynooth this evening. The annual meeting of Irish Science Teachers took place in the Glenroyal Hotel. The theme of the conference was ‘effective science communication’. It is vitally important we support our teachers and in particular sciences teachers and those who focus on STEM subjects. We have evidence to support the fact that there is a growing need for graduates educated to the highest level in this area. The only way they gain that knowledge is from the excellent teachers providing them with this material. I was delighted to attend tonights conference to lend my support and let the organisation know Fianna Fáil will also support them.